Has your staff had trouble researching lab orders that have been recorded and what the status is? Do you want an easy way to find out what orders have been received, which ones are still outstanding, who has not been notified who has been notified but their jobs have still not been picked up? Do you want to check what orders have not been invoiced? 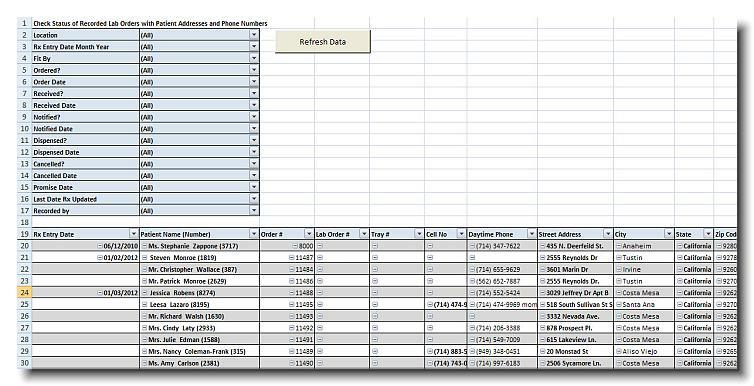 Do you want to be able to select lab orders based on multiple promised dates? Are you curious how many lab orders are cancelled during a period? Do you want an easy way for your staff to track lab orders? If you answered yes to any of these, this report is for you. 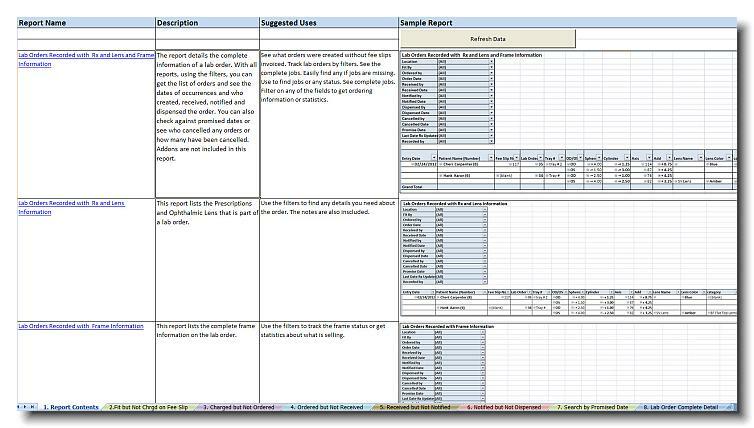 This report will "give you a handle" on your frame and lens lab orders! These are the worksheets your active dispensers need to keep track of orders and notify patients to pick up their jobs. 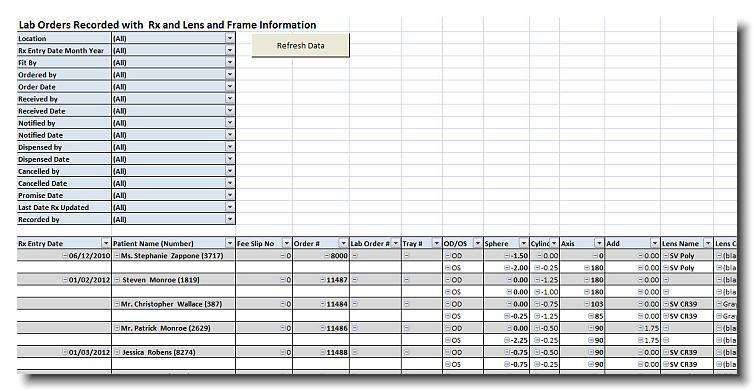 These series of reports give the details of a frame and lens order. 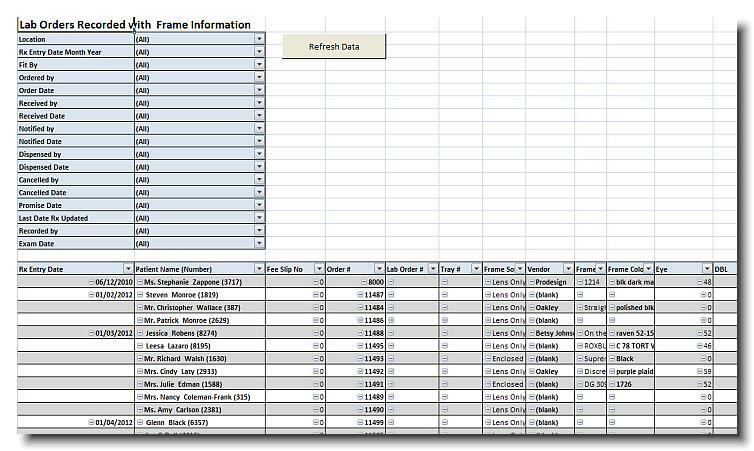 Individual worksheets have the details of the complete job, lens information, frame information, and the patient name, address, email address, phone numbers, etc. Find lab orders that have been recorded but not charged, fit but not ordered, ordered but not received, received and patient not notifed and patient notified but not dispensed. Soft Contacts and Rigid Contacts tracking is available in #610 and 620. See how the Lab Order tracking eyeReports can help staff be more efficient and effective in our 2 minute video! With the filtering option, you can select Blank Fee Slip Numbers in the fee slip column and get a list of all jobs that have not had an invoice created for the job. The report details the complete information of a lab order. With all reports, using the filters, you can get the list of orders and see the dates of occurrences and who created, received, notified and dispensed the order. You can also check against promised dates or see who cancelled any orders or how many have been cancelled. 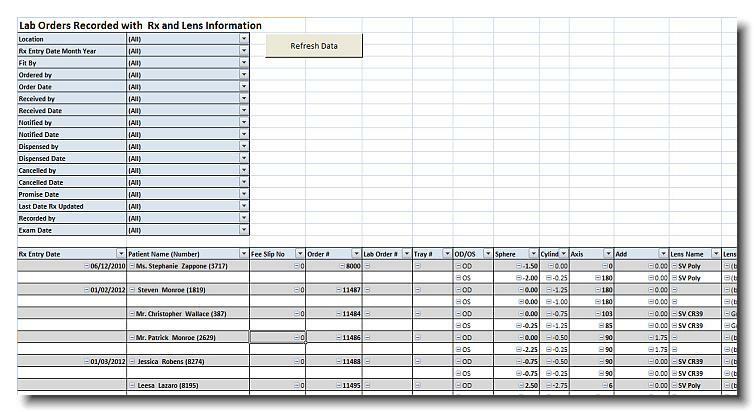 This report lists the Prescriptions and Ophthalmic Lenses that are part of a lab order with complete detail including the notes that were added. With the filters you can check what jobs went to which labs, which jobs were not invoiced on a fee slip, what trays the orders may be in, what is the prominence of colors, tints, categories, etc. This report allows you to check the status of orders. Find out what orders have been received and which patients have not been notified. Or who has been notified but not dispensed. Or who has cancelled. What orders have not been received that are past the Promised date, etc? The process of finding the orders is simply using the filters to find the patient names and then their phone numbers are there for patient follow-up.